Emes Ve-Emunah: Will Satmar Win the Battle but Lose the War? Will Satmar Win the Battle but Lose the War? How will these young Chasidim support their families? One of the issues dearest to my heart, is the issue of educating our people. Both in Limudei Kodesh (religious studies) and Limudei Chol (secular studies). By our people I mean all of the Jewish people. In the realm of the former, there is a serious void among secular Jews. Far too many of us have no clue - or precious little knowledge about - what Judaism actually is or demands of us. On the other hand, there are many Jews in Orthodoxy about which the same thing can be said about the latter. Educating those among us in America that are un – or undereducated in Limudei Chol is what I want to focus on. Which for the most part are insular communities like Satmar. I’ve discussed this more than a few times. They do not have much of a secular education in elementary school (if any) and zero in high school. Proudly so. They spend their entire day in Limudei Kodesh. I cannot protest enough against a Chasidus that refuses to give its male children the tools necessary to make a decent living in the 21st century . Add to that being as insular as possible and taking pride in the inability to speak English well. They see the English language as being to assimilationist! The result - as has been documented in statistical studies - is a community that is composed almost entirely of very large families that live in poverty. 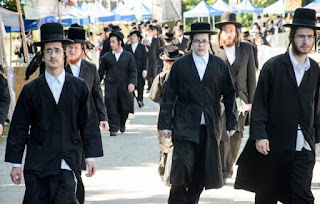 Although most of these Chasidim seem to lead happy lives, it is surely not because of their poverty. No one can be happy living that way, no matter what face they show in public. There may be an inner joy in their Chasidic way of life. But it comes at a price. One that must cause a lot of anxiety about how they will pay their next bill. Living in that kind of anxiety is not joyful. There have been attempts by organizations like YAFFED (which shares my concerns) to force the issue. They have contacted government agencies tasked with insuring that educational standards demanded of private schools are observed. That has brought some reaction by the government to examine the situation – and remedy it. The State legislature is trying to pass a law that will force compliance to these standards. I have supported these efforts. I cannot stand idly by and watch good people being virtually forced to live in poverty by way of a Hashkafa that all but ignores Limudei Chol. I am not alone. There are stories of Chasdim that secretly want to see Limudei Chol in their schools - but are too afraid to say anything about it publicly. It took an expatriate Chasid, Naftuli Moster, founder and CEO of YAFFED to try and move things along in that direction. Having lived among them - he knows what many Chasdim in these enclaves really think. I don’t know how benevolent it is to turn a blind eye a community - ignoring a program designed to better its citizens’ lives. There are actually some activists in this community that have publicly admitted that the problem is real. But that it should be handled internally. Normally I would agree with that. The problem is that the Hashkafa of Satmar is opposed to changing anything. They want their Chasidim to remain insular, to speak English poorly, and to be generally ignorant of Limudei Chol. There will therefore be no change without outside pressure. The Chasidic leaders of these groups will push back with all their might. Which brings me to an interesting op-ed in the Forward on this subject by Rabbis Yitzchok Adlerstein and Michael J. Broyde. They responded to the question of why organizations like the OU and even the Jewish Federation have not come out in support of the aforementioned bill in the New York State Assembly that would put teeth into regulations requiring certain subjects be taught in private schools. What’s interesting about this is not they are opposed in principle to the idea that these communities should be teaching Limudei Chol. They argue that the constitutional merits of the case favor Satmar. The religious freedom guaranteed by the 1st Amendment overrides any regulations that the State wishes to impose. This was demonstrated by a Supreme Court decision (Wisconsin v. Yoder) involving the Amish. The state of Wisconsin requires every student be educated until at least age 16. They were sued by the Amish who maintained that their religion prohibited educating their children beyond eighth grade. And they won! “No one is obligated to send their children to school — any school — if it violates their religious rights. They do not even have to home school them…” say Rabbis Adlerstein and Broyde. Satmar — an economically poor and secularly uneducated community — might choose to live without the state aid, rather than engage in the religious compromise needed to get funding. These Satmar children that we are all seeking to help will now not only have less education than before, but they will be hungry and cold as well, since state aid will be gone. I truly hope it does not come to that. I have no joy or interest in ‘starving’ Satmar submission. But that seems to be the likely scenario. The Satmar Rebbe will not give in. Satmar may win the battle. But will they lose the war? I don’t see Satmar Chasidim pulling their belts any tighter than they already are right now. How will this end? God only knows.